With all the cash behind Google you would have thought they’d do a much better job promoting and marketing Google Apps for Business. After 3 years, Google boasts 30 million users online but most of these are in the US and it’s very unclear how many of these users actually pay the $50/user/year subscription and/or use anything more than Gmail. Here in Australia, with Google Apps still very much in early adopter stage; you have to wonder if the low key advertising campaign on billboards, buses and lifts is really going to hit the spot and bring Google Apps into the mainstream. Google have enormous inertia to overcome if they seriously want to compete with Microsoft in the corporate world. There’s so much invested in the traditional Wintel server architecture and associated ecosystem (think sysadmins, vendors, training companies, software developers etc). Apple have been fighting this for over 20 years and failed miserably. But the market is ripe for change. Business is tiring of the industry fed hardware/software/hardware upgrade merry-go-round. Business leaders want to focus on doing what makes their businesses special (and profitable). They do not want to have to worry about IT. They especially resent that portion of their budget that is spent on IT each year – for very little perceived value in return. Seriously, strip away all the marketing hype – are businesses that much more efficient for upgrading to Office 2007? Did they really have a choice? What about Office 2010? Exchange 2010? SQL Server 2010? What about viruses, spam, security, disaster recovery, remote access? What if they could just pay someone a nominal fee to take all this hassle away? The Wintel upgrade cycle is on an upswing again in the corporate world. This time round CIOs are trying to work out when to upgrade to Windows Server 2008 R2, Exchange 2010, SQL Server 2010, Office 2010 and, of course, thousands of laptops and PCs from XP to Windows 7. That’s why I believe Google has a window right now to strike with Google Apps and get a foothold in the lucrative corporate market. If they fail to do so, the window (pardon the pun) of opportunity will be closed for good by Microsoft and the Wintel cartel. Take Microsoft’s Office Web Apps – it’s not really ready for prime time (you can’t even insert a page break into a document) but it does enough to convince CIOs that Microsoft will have a cloud computing solution – if not now then soon enough. And that’s all the FUD Microsoft need to ensure the decision to stay on the merry go round goes their way. So let’s look at the number one reason why businesses should move to Google Apps (and the one area where I believe Google has fallen down badly) – the business case. Forget the coolness of cloud computing and all the fancy stuff it can do. What CIOs and CFOs want to know is how much money they will save and whether it’s worth the risk – after all it’s their job. You have to look at the issue holistically. If I am trying to convince a business to “go Google” on business case alone, you need to look at all IT expenses they would face in a traditional Wintel environment compared to that which can be offered by Google Apps for Business. In a traditional Wintel implementation, this setup would require a mid-range server running Microsoft Small Business Server, a LAN of laptops or workstations, each with Windows and Office installed. Virus protection would be installed to the server and used to keep the workstations up to date. Windows Server Update Services (WSUS) would be used to distribute patches to the workstations on a weekly basis. An agency like Message Labs would be used for Email security and virus protection. Backups would be done on a daily basis to a rotating tape library, at least one of which would be rotated off-site once a week. ADSL2+ would be used for the primary Internet link. Optimally, there would be a second server in an off-site location to act as a disaster recovery platform and a backup Internet link; I haven’t included either in the modelling. A properly certified IT consultant might take 40 hours to install and configure this equipment and software. The same IT consultant would be on retainer to come in once a week to check the logs, make sure the virus protection and patches are up to date and deal with any user issues. Let’s say that takes 2 hours per week. Let’s examine in detail the cost of such a setup. For the pricing, I have used published prices from local Australian online retailers – correct as at 18 November 2010. We end up with a four year total cost of ownership (TCO) of almost $100K and a cost per user of $4,605 in the first year. I always use a 4 year TCO period as this is about the time-frame most businesses use to fully depreciate IT assets and is also about the maximum life you can expect to get from these assets. So in year 5, the business should budget at least the same capital expense as year 1. The interesting thing is that other than the workstations, the bulk of the costs are not dependant on the number of users. This is because many of the fixed costs, such as the server hardware, server software and Internet connection are needed whether you have 3 or 40 users. To illustrate the economies of scale at play in this model, here’s a table of the TCO and cost / user at increasing numbers of users. The more you study his table, the more you realise why the Wintel/Exchange/Office ecosystem is targeted at large corporates – they are the only ones who can get the scale necessary to get the cost/user/year down to a reasonable level. The problem is that every small business needs the same level of security and functionality as corporates need – whether they have 3 employees or 40. Until now though, small businesses have had little choice but to play the same Wintel game and purchase a server, with redundant storage, tape backup and MS Small business server. As I have shown its an expensive game and – not surprisingly – one many small businesses try to skimp on – only to end up in disaster. Now let’s look at the Google Apps for business alternative. Same hypothetical small business starting out with 10 employees, no existing IT infrastructure and identical needs. This time the business is “going Google” and signs up for 10 users on Google Apps for Business at $50 each/year and gets a Google Apps reseller to help them out for one day to register the domain, MX record and setup the users. This time we have no server, no server software, no backups, no disaster recovery, no UPS, no MS office. Just the same business grade Internet link, some low end workstations (you don’t need much local power to operate in the cloud) and some client based virus protection (just in case). This time we get a 4 year TCO of $38K. A saving of $60K over the 4 years – or $15K per year. More importantly is the difference in first year cost – $46K vs $14K. That $32K difference would be important to any business starting out. 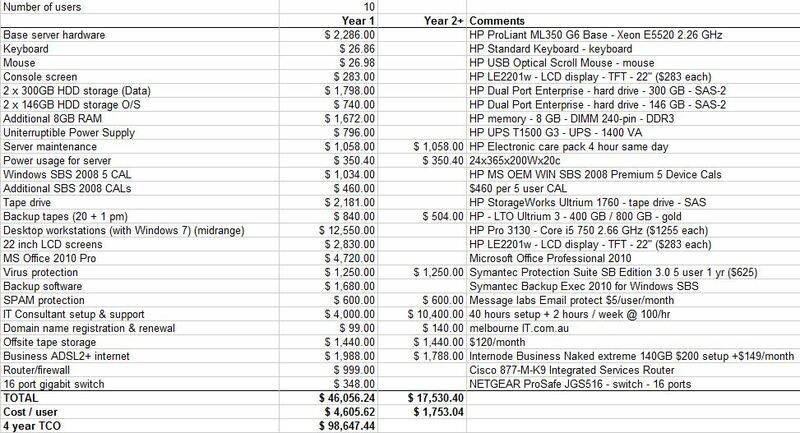 Further, the total cost per user of $1,407 in the first year is about the cost of a mid-range workstation. So on a pure cost comparison, choosing Google Apps is a “no-brainer” for all businesses. Try a bit harder to get the word out Google, make the most of this window. For those who want to use my sheets to prepare your business case to migrate to Google Apps for Business, feel free. I have published them here.